Summary from Goodreads: When Julia finds a slur about her best friend scrawled across the back of the Kingston School for the Deaf, she covers it up with a beautiful (albeit illegal) graffiti mural. 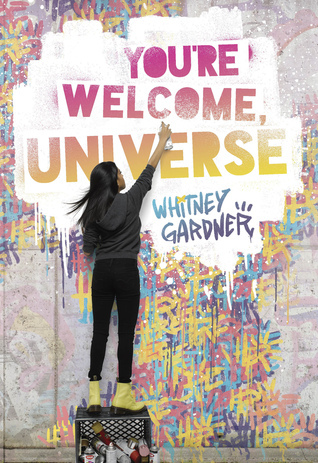 You’re Welcome, Universe by Whitney Gardner was such an amazing book. It hooked me from page one and it was impossible to put down. I’ve never read from the point of view of someone who is deaf, so it was very eye-opening for me. The writing wasn’t amazing, but I absolutely loved the storyline. Our main character is Julia, who is a deaf, Indian girl. She attends a school for the deaf, well, until she doesn’t. Upon finding that someone had written a slur about her best friend on the back of the school, she covers it up with her own art. Trying to stand up for her friend, her friend ends up ratting her out and Julia gets expelled. So, Julia switches over to the local public school. There she meets “YP”, which stands for Yoga Pants (and no, that is not her actual name, just a nickname. With some ups and downs, the two soon become friends, but Julia still hasn’t stopped graffiting. I really liked Julia. Sure, she could be quite angsty and just bitter, but I still liked her. She was a strong character who wouldn’t take anything from anybody. When her “best friend” rats her out after vandalizing the school, Julia just kind of drops her. She doesn’t try to listen to her fake apologies and sympathy. Instead, Julia moves on. Julia was also very stubborn, which to be honest, is a quality I feel like we see a bit too much in YA. That didn’t mean I liked her any less though. Like I said, I’ve never read a book from the POV of someone who is deaf. And I’m so glad I decided to read this one. Honestly I didn’t know much about it but I saw it on NetGalley and I thought it looked good, so I requested it. Anyway, I’m very glad I read this book because it really opened my eyes. We get to see the world from the perspective of someone who can’t hear anything. Not only is Julia deaf, but so are her two moms. She grew up attending a school for the deaf where they spoke sign language. So once she’s expelled, she has to have an interpreter to tell her what everyone is saying. I thought it was really interesting getting to hear Julia’s thoughts on all this and also seeing how people treated her and reacted to this. They didn’t treat her poorly, but some people definitely tried to get in her way. I think one of my favorite parts about this book was watching Julia become friends with YP. She was so anti-friends at first and even ignored YP originally, but then the two start to become friends. I love strong friendships in books, and even more so I love getting to read about one as it develops. One scene that really seemed to stick out to me was when Julia was in her English as a Second Language class. She is asked to write about her biggest inspiration, and she she chose to write about her mom’s. But the teacher starts correcting her paper, crossing out moms to mom and fixing some of the words. Julia gets angry, saying that she actually does have two moms. I don’t know why, but this scene really stuck out in my mind. I also keep thinking about the part where Julia and YP start to kind of become friends after Julia is hit in the head in gym class. They had already met, but right there was kind of the start of their friendship, YP’s ex-boyfriend hitting Julia in the head during class. And though it’s hard for them to communicate, they are able to figure out how. I loved that scene and just how YP and Julia became friends in general. The writing wasn’t amazing like the rest of the book in my opinion. One thing I would have liked was more description about Julia’s art. The author included her own illustrations (which I LOVED). I’m not saying that she should not have included these, just have added more detail in her writing to give us a more clear picture without actually seeing it. I know that probably makes no sense though. But overall the writing was just kind of mediocre. Not bad, not great, just kind of inbetween. The whole graffiti war thing was also pretty interesting. It was definitely a lot more intense than I expected when I first started reading this, but I still liked it. I don’t know really anything about graffiti and street art, so I learned more about it through this book as well. Like I said though, I just would have liked more descriptions about the art in writing, not all of it just shown in the picture. Overall, I really enjoyed You’re Welcome, Universe! It was addictive and very interesting all at once. I loved the friendship Julia develops with YP. I also thought it was interesting and eye-opening to read from the perspective of someone who is deaf. Also, romance wasn’t a hauge part of this book, which I’m really glad about. It was there, but didn’t take away from the actual storyline. I definitely recommend you check this book out! 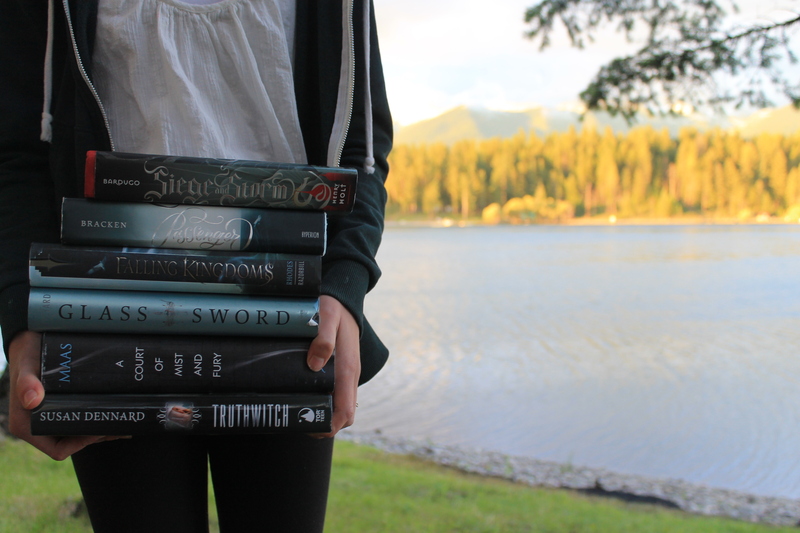 This book looks SO GOOD! I need to read it soon.